Every home has a story to tell; explore a bit of local lore at this spacious three-bedroom ocean-view house in peaceful Tolovana Park, where all sorts of fascinating historical relics are on display. Enter through the bottom floor into a casual, roomy den offering ample room to romp, plus a few cozy couches, a foosball table, an electric fireplace, and a pullout Murphy bed for any surprise visitors. 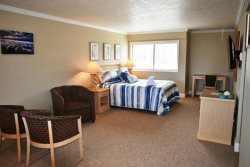 This floor houses a pair of clean, bright bedrooms, one featuring two twin beds and another offering a queen bed. You’ll also find a bathroom with jet tub plus a dedicated laundry room. Trek up the stairs past an enormous map of the world into the home’s main living area, which boasts lovely ocean views out over the treetops and fresh breezes through a suite of windows. Relax into a large living room with a sectional sofa, gas stove and a huge flat-screen television/entertainment center and start soaking up the stories: arranged around the home’s hearth is a proud collection of historic family photos and mementos, while a genuine whale bone takes pride of place at the center of it all. Anderson Trail House is outfitted throughout with plenty more beach baubles as well as some beautiful coastal photography. The nearby dining area lets in plenty of light and leads to a west-facing porch — the perfect perch for surveying your surroundings at the end of a busy day on the beach. In the large, amply stocked kitchen, you’ll find a gas stove, small bar, and tons of space for cooking comfortably. There's also an additional bedroom on this floor with a queen bed, walk-in closet and a bathroom boasting an enormous jet tub and shower, also accessible from the hallway. Back outdoors, you’ll appreciate the home’s large, quiet lot, featuring plenty of parking, set just a block away from access to a quiet stretch of sand. And the garage is hiding a secret thrill of its own: a Ping-Pong table! Anderson Trail House is a true testament to the North Coast’s rich past. Come revel in the stories, then get out there and make some family history of your own.